They get their energy drained to till they’re at the brink of death, which gives Moro quite the significant power boost, as if he wasn’t dangerous enough already. Weirdly enough, not an inkling of Ultra Instinct mentioned, considering how drained Goku is. I guess it all happened too quickly for Goku to even think about it, but honestly, I wouldn’t be surprised if we never see Ultra Instinct in the Manga ever again. The problem is, now it’s a thing, all anyone is every going to be asking is “why isn’t Goku using Ultra Instinct?” all the time. The T’s are damned if they do and damned if they don’t with the form, I really don’t want to see it overused like Blue became, but people are thirsty. Speaking of which, Moro consumes the energy he drains from the two Saiyans and undergoes a transformation of his own, somehow becoming younger? Honestly, I don’t like the redesign, Moro was a unique looking villain, an ancient wizard goat man, with his younger self looking more like a classical buff Dragon Ball character, I worry that he’ll undergo yet another transformation in the future that’ll make him look all the less interesting. While this is happening, we cut to Beerus and Whis, who are doing Beerus and Whis things on his planet, bickering with one another mostly. Whis however seems acutely aware of what’s happening on Namek, although he fails to mention Goku and Vegeta’s presence on the planet to Beerus, who seems disinterested because the Namekians don’t produce delicious food. I’ve been wondering about these two all arc, they might be the easy fix for the Moro problem, but getting them involved would kind of undermine Goku and Vegeta, so I’m happy for them to stay out of it for the time being. Although if Moro continues to grow stronger, he could possibly reach levels of power beyond even Beerus. Which means this could be the arc where the Saiyans finally reach a state in which they could surpass Beerus, it was always going to happen eventually. With Goku and Vegeta left for dead, Moro starts travelling around Namek to collect the Dragon Balls, leaving them to their fate. Which happens to be getting rescued by the Namekians of the village they saved in the first place. 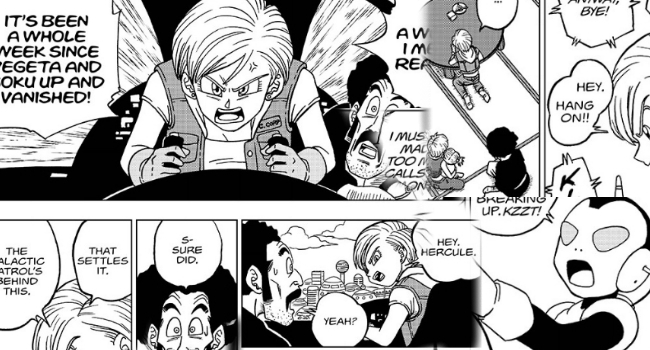 Back on Earth, we realise Bulma is fuming because Goku and Vegeta left without telling her where they were going, a week previously, and she angrily calls Jaco when Mr. Satan informs her it was the Galactic Patrol responsible. We get some good back and forth between the two, learning that Majin Buu is awake and eating all of the patrol’s food. I’m curious if they’re actually going to do something with the previous Supreme Kai inside Buu, I hope so. Three days pass on Namek, Goku and Vegeta finally wake up thanks to some Namekian healing, although they’re still in pretty bad shape. They learn that Moro has collected three Dragon Balls and is ravaging anyone in his path. In pretty brutal fashion too. Unable to do anything, even escape, the Namekians assure Goku and Vegeta that they have a final trump card, the seven strongest of their people are en route, planning to all fuse together and take down Moro. 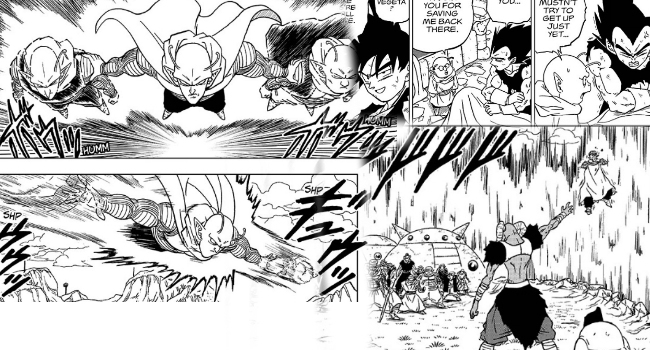 We get a really cool sequence of the Namekians flying and fusing as they encounter one another, it’s a shame it all amounts to a hole in the chest. I liked this chapter. Things are playing out almost as exactly as I thought they might, so far there is no new ground being broken here. But I’m enjoying it still. Moro doesn’t seem like an especially interesting villain when it comes to what he know of his motivations, where I find him interesting is in his power set, which still feels unique to the antagonists seen throughout Z and Super up until now. I worry that, as the arc goes on and he accumulates more power, then he’ll just turn into a generic Dragon Ball styled fighter, much like what has happened to both Hit and Toppo. With basically everyone expecting the return of the anime in a few months time, reading this story is making me all the more excited to see it transformed into a cartoon. 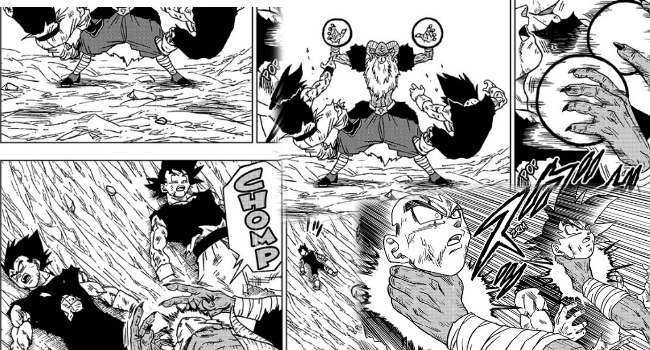 I just hope that Toyotaro’s writing here makes the alternative product better than the first shot at Super. Posted on March 27, 2019 March 26, 2019 by WooderonPosted in Anime, Condensed Reviews:Tagged chapter 43, dragon ball, dragon ball super, goku, manga, moro, namek in decline, vegeta.